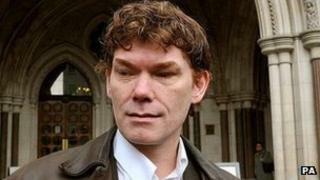 Theresa May has rejected an appeal by the mother of UK computer hacker Gary McKinnon to bring forward a decision over extraditing him to the US. The home secretary will decide by 16 October, Mr McKinnon's lawyer has said. In July, Janis Sharp pleaded outside court for Mrs May to "show a little bit of compassion" to rule sooner. If convicted, Mr McKinnon, who admits hacking US military computers but says he was looking for evidence of UFOs, could face up to 60 years in jail. If Mrs May allows the extradition to go ahead, his lawyers are expected to apply for a judicial review to challenge that decision. His lawyer, Karen Todner, said: "Should the decision from the home secretary not be in Mr McKinnon's favour, the High Court has fixed the case for hearing on November 28 and 29." Mr McKinnon, from north London - who hacked into the military computers in 2002 - has been fighting extradition since 2006. Mr McKinnon refused to undergo a medical test in the summer to see if he was fit to be extradited to the US. Experts had said there was a high risk Mr McKinnon, who has Asperger's syndrome, could take his own life if extradited. Mrs May had said she was "personally concerned" he had not been examined by a Home Office-appointed medical assessor. But his family said the expert appointed by the Home Office had no experience in uncovering suicidal tendencies in Asperger's syndrome patients.